The standard top slide covers only a limited range, 55 mm, without getting to a situation where the top slide is only held by one gib screw. 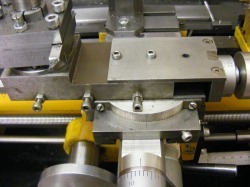 Having at least two gib screws in contact with the gib and dovetail is important for stable and reproducible setting of the topslide. This problem shows itself particularly when cutting MT2 Morse tapers. It is just about possible to cut an MT2 taper but the gib has to be very tight to limit any movement. This makes the top slide very difficult to move smoothly and hence the finish on the taper suffers. This modification was made to overcome this problem. At the same time as this modification was made I also added a ball bearing to the topslide. The modification is shown above. 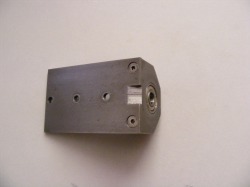 It consists of a top plate bolted to the top of the top slide. On the right hand side of the top plate is mounted a bearing block. The top plate has three holes but only two screws and this means that the top plate can be fixed in two positions. The photo above shows the top slide set in the normal position. In this position it functions in exactly the same way as the standard top slide. This photo shows the top slide in the extended position. Note that the top plate has been moved to the right and this displaces the bearing block to the right. In this position it is possible to cover a range of 80 mm whilst keeping at least two gib screws in contact with the gib and dovetail. This is more than sufficient to cut an MT2 taper. The downside to the mod is that in this mode the topslide overhang is large, as shown above. For cutting tapers this is not too much of a limitation since the cut on each pass is quite small. The top plate was made from 1/8" x 2" steel. 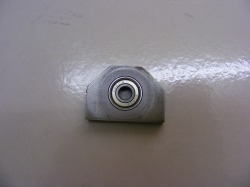 This photo shows the bearing block. This is cut from a piece of 50 x 10 mm bar which is drilled out to 13 mm and then bored out to 22mm for a depth of 8 mm to provide a bearing recess. The bearings used are 608ZZ. These are very cheap bearings manufactured by the million for roller skates. 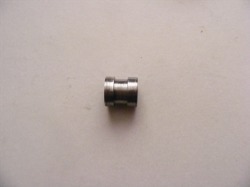 The bearing is retained by a 4 mm grub screw. Here you can see the bearing block attached to the top plate. The holes in the top plate are 25 mm apart. The bearing end of the top plate is bevelled in the centre and scribed with a line against which the graduated dial can be read. This shows the new feedscrew. It was made from 10 mm free cutting steel rod. 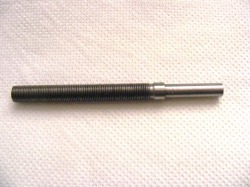 Note, there is no groove for the friction spring on this feedscrew unlike standard feedscrews. The friction collar. The standard spring is retained in the groove by the graduated collar. 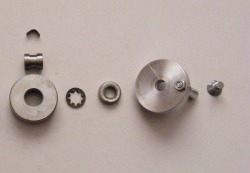 This system was developed by John Moran (www.gadgetbuilder.com) and is much better than the standard system since the friction collar can be remove from the lead screw complete with the graduated dial. With the standard arrangement the tiny friction spring tends to fly off in any direction when the graduated dial is removed from the lead screw. This photo shows the other components of the lead screw. The graduated collar (left) is shown with the friction collar and spring above. These are assembled together as one unit that slides onto the leadscrew . Next is placed the spacer ,then the shakeproof washer and the handle. These are all retained on the end of the leadscrew by a 6 mm screw (right). In the normal mode the top slide operates as the standard top slide except that the movement is easier and smoother due to the ball bearing. In the extended mode the modification works very well and greatly facilitates cutting MT2 tapers. It is only used in the extended mode for cutting tapers greater than 55 mm long.